There’s nothing quite like sitting in a room full of people who are all fans of the same thing. 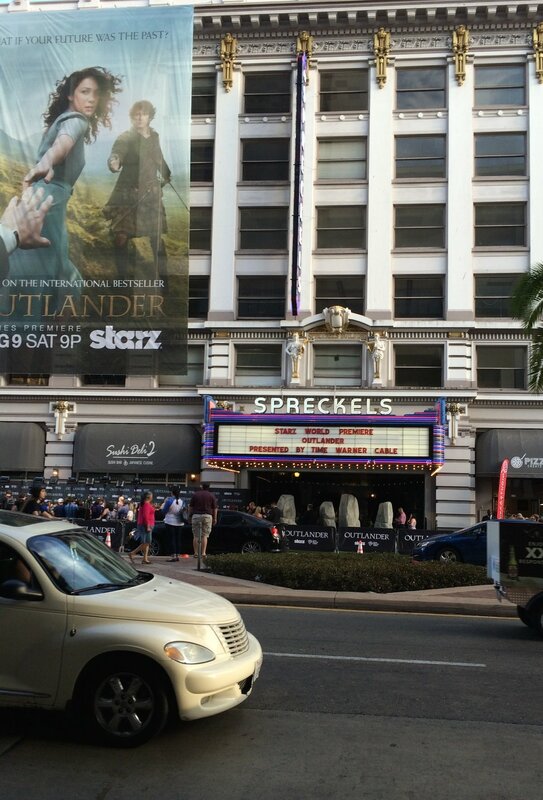 Comic-Con has no shortage of such rooms, and such was the case for Starz’s premiere of Outlander at the Spreckels Theatre in San Diego Friday night. 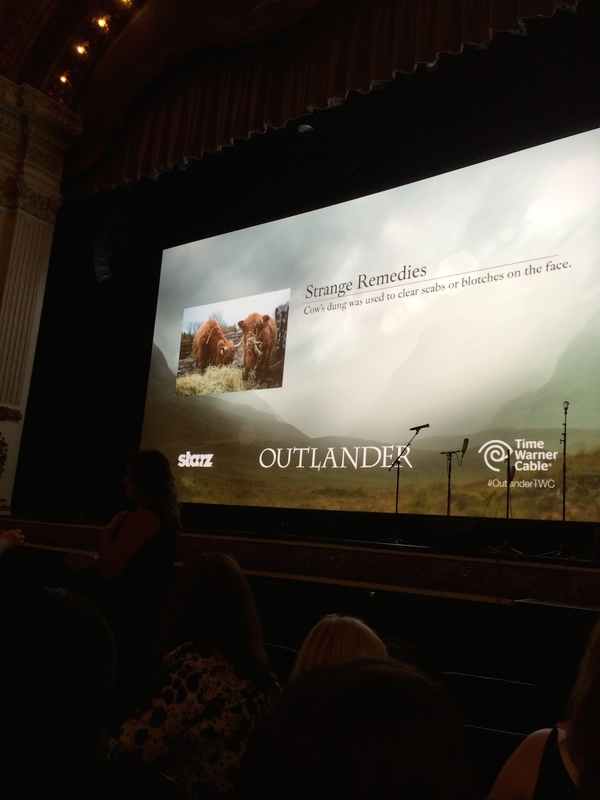 The full first episode of Outlander screened to a theater of enthusiastic fans, and the cast was in attendance, along with series developer Ronald D. Moore, author Diana Gabaldon and series composer Bear McCreary. 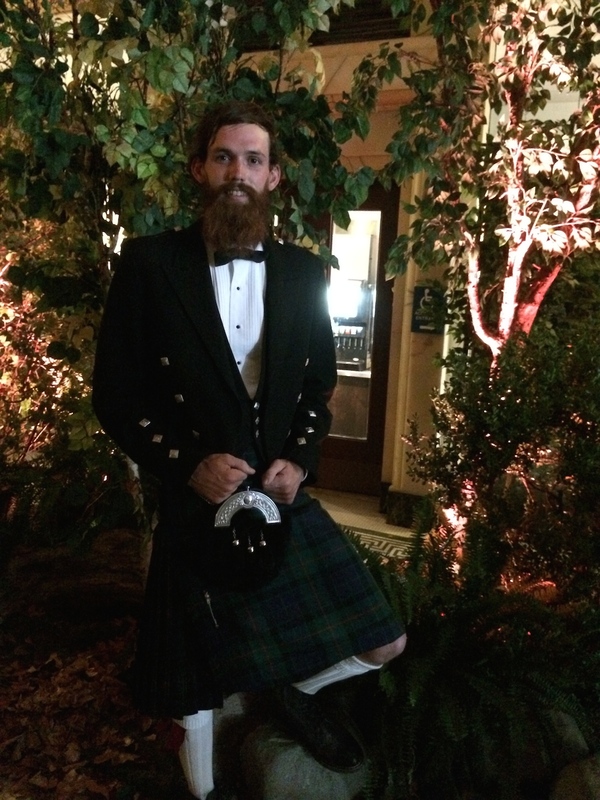 There were also kilted men standing just inside the theater for photo opportunities. While some people milled about, admiring the decor of the lobby, or picking up a branded bottle of water, or chatting about the series with other fans, I headed into the theater to find my seat. It was evident by the conversation in my vicinity that there were a lot of book fans in the audience, and there was no doubt that they were well familiar with the stars of this new series. 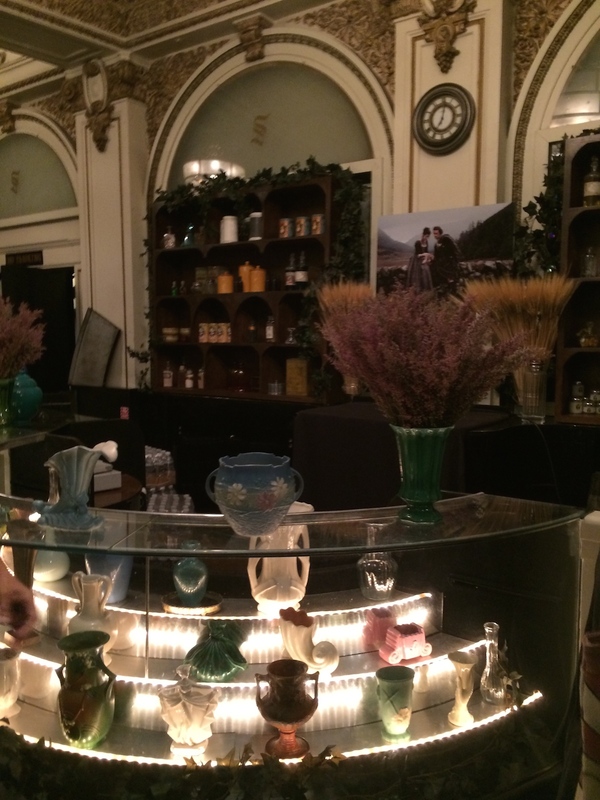 Each time one of the Outlander actors was ushered into the theater, they were greeted by enthusiastic applause, which spread throughout the theater as more people noticed them. 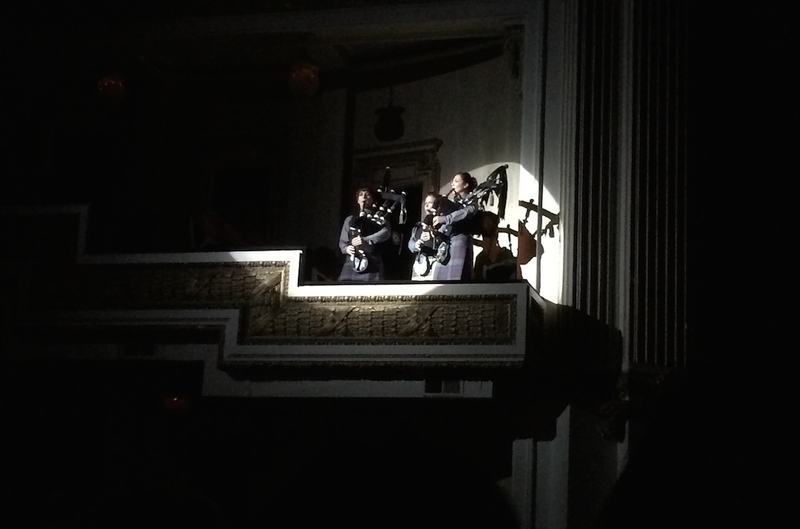 The actors were seated in the theater along with everyone else, and the night began with some bagpipe music and a brief introduction, which led to a performance by Outlander composer Bear McCreary and violinist Paul Cartwright. 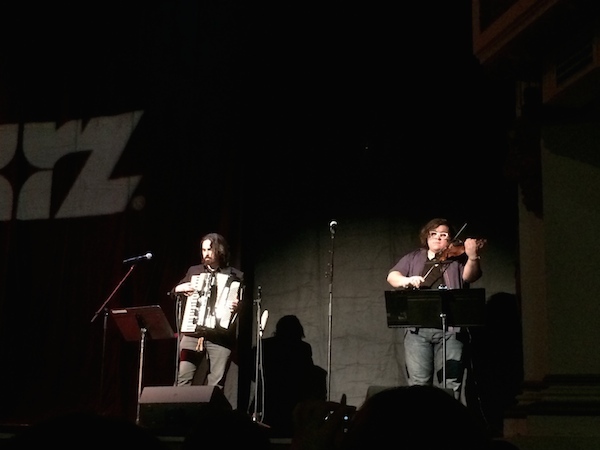 If you’ve seen Battlestar Galactica, The Walking Dead, Caprica, Da Vinci’s Demons or Black Sails (among other shows), then you’ve likely heard Bear McCreary’s music. 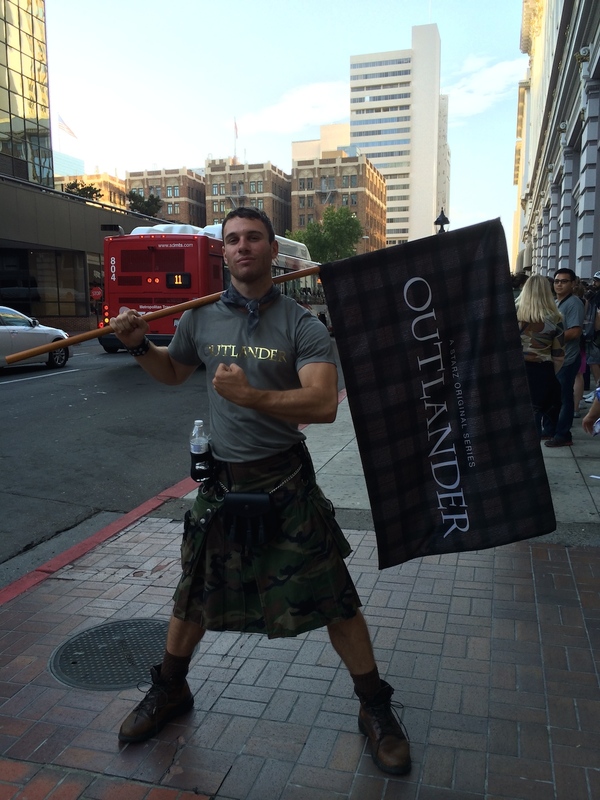 He’s proven outstanding at enhancing great TV dramas with emotional and heart-pounding music, so his involvement with Outlander is one more reason to be excited about this series. I got chills (the good kind) more than once as he and Cartwright played. Violinist Paul Cartwright has credits on Battlestar Galactica and Caprica, so you may have heard him play as well. 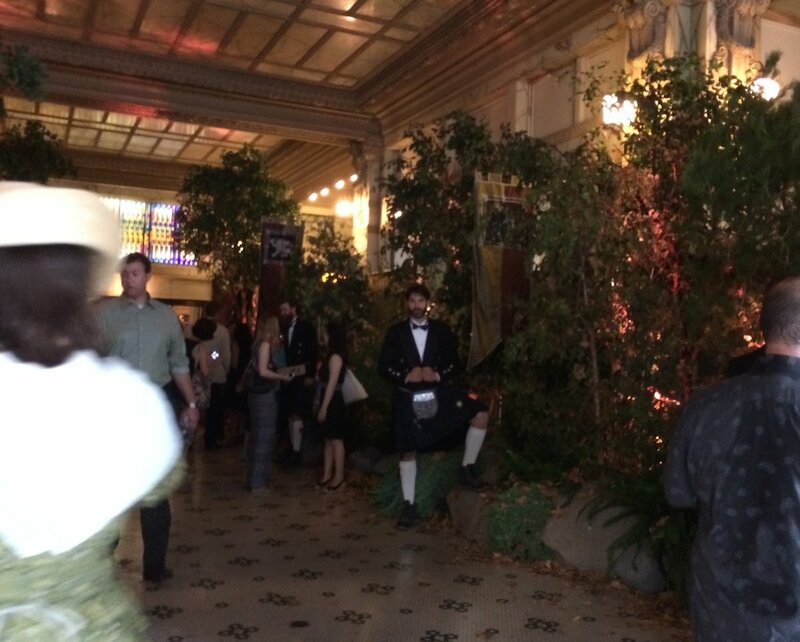 The duo kicked off their set with some traditional Scottish music, and then they debuted Claire and Jamie’s music. We’ll hopefully be hearing quite a bit of that beautiful and haunting melody throughout the series. 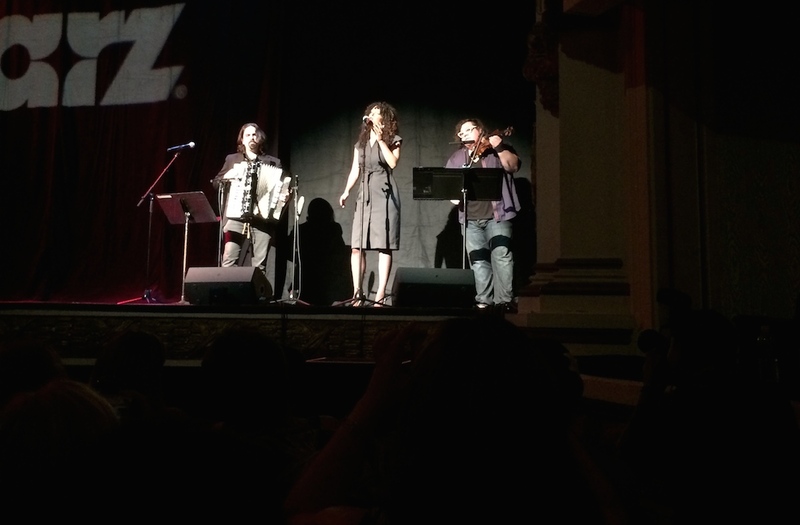 Also beautiful was the Outlander opening theme song, which was also performed live on stage before the screening began. As I said, there’s nothing quite like being in a room with a group of people all excited about the same thing, and that applies to the experience of watching the first Outlander episode surrounded by fans of the books. The audience was buzzing with anticipation as the episode began, and there was applause as the title came up. From there, the fan reactions were limited to very specific moments, which was perfect as it really didn’t disrupt the screening. They laughed during the funny parts and reacted during a couple of the romantic moments. And of course, they applauded at the first glimpse of Jamie. But after each reaction, fans quickly fell silent, likely trying not to miss a moment. The screening closed out to more applause from the audience, after which the cast, Ronald Moore and Diana Gabaldon took the stage for a brief Q&A segment. 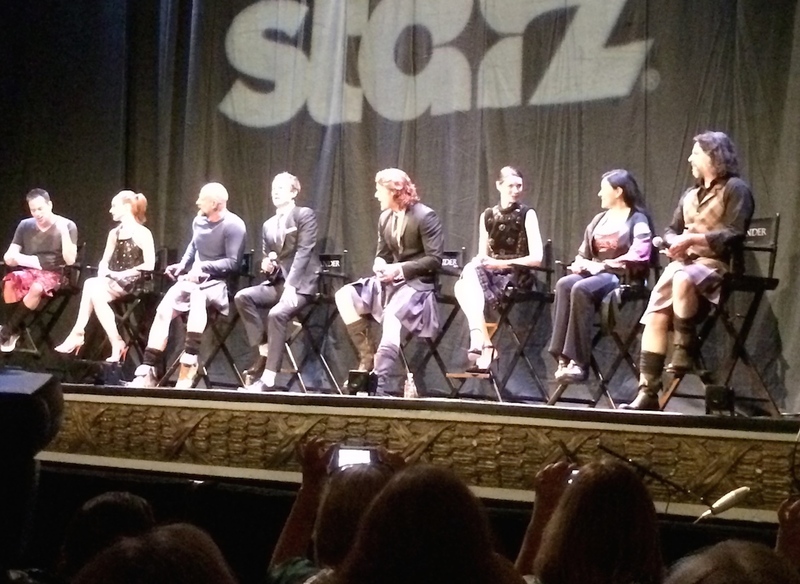 Diana Gabaldon, Lotte Verbeek and Caitriona Balfe took the stage looking stunning, and Graham McTavish, Sam Heughan and Ronald D. Moore all showed up in kilts. Among the topics of discussion, Ronald Moore talked about honoring the spirit of the book and how the show will always aim to “circle back” to the book whenever changes do need to be made in the adaptation. The crowd cheered when Sam Heughan said “Sassenach.” The audience was able to Tweet questions to the panel, and someone asked if Sam had to do a chemistry test with Tobias Menzies, noting that he had to do one with Caitriona Balfe. That got some interesting reactions. When Tobias Menzies was asked if Black Jack Randall had any redeeming qualities, he had a hard time trying to answer that one, which got some laughs. “I’m incredibly jet lagged,” Menzies explained to a giggling crowd. Later, when the panel was asked what time period each of them would like to travel back to, Menzies longed to return to five minutes ago so he could answer that Jack Randall question better. Lotte Verbeek said she’d like to visit Paris in 1895, Caitriona Balfe said New York in the 20s. 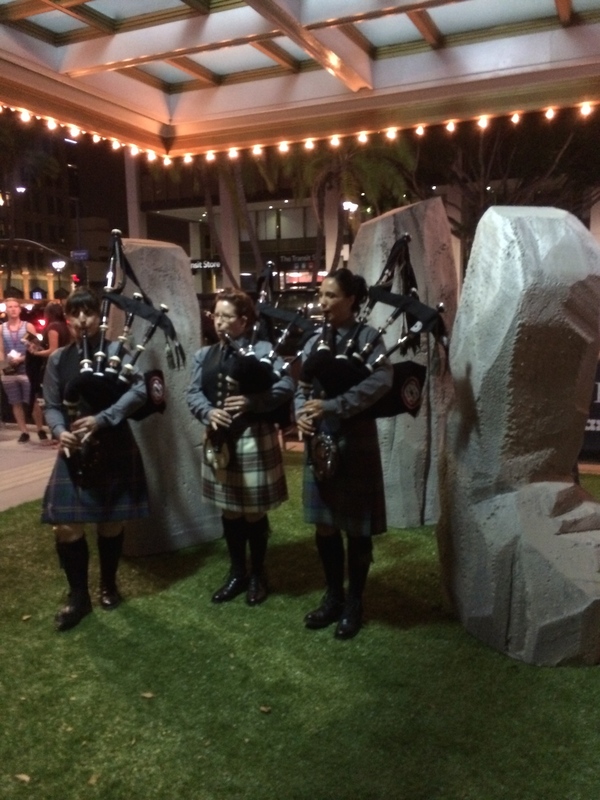 When the event ended, we filed out of the theater to another bagpipe performance, which was set up just outside amidst a set of standing stones. I’ll share into my thoughts on the actual series once we get a bit closer to the Starz premiere. But in the meantime, based on the reactions of the audience both during and after the episode, I got the impression people were into it. Over all, Starz put on a really fun event for Comic-Con, and it was great to watch the first episode of Ronald Moore’s adaptation in the company of some of the people who are anticipating this series the most. 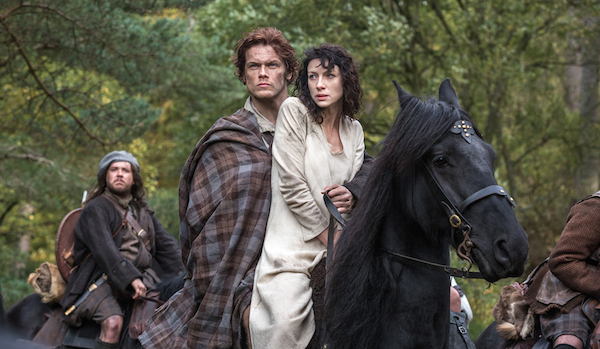 Outlander premieres Saturday, August 9 at 9:00 p.m. ET/PT on Starz. 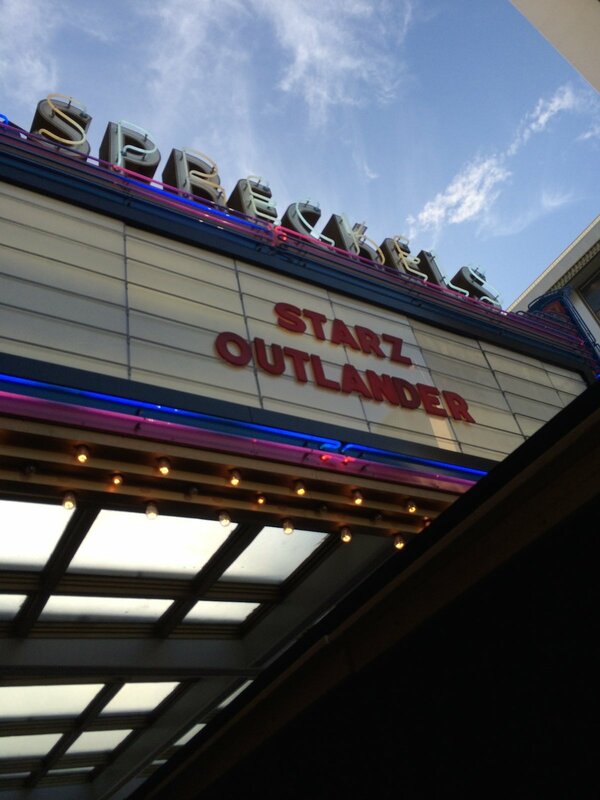 Check out more photos from the premiere event and the new Outlander trailer after the jump!